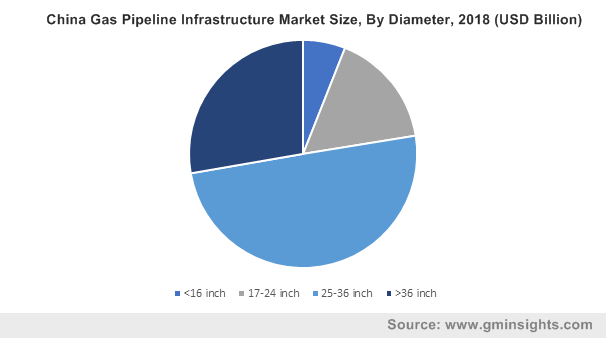 Gas Pipeline Infrastructure Market size was valued over USD 1 trillion in 2018 and cumulative pipeline installation is set to exceed over 7 million kilometers by 2025. Paradigm shift toward clean energy sources along with growing penetration of natural gas across major industries including power generation, chemical, manufacturing and residential & commercial will fuel the gas pipeline infrastructure market growth. Ongoing regulations concerning carbon emissions and energy efficiency are the key industry parameters stimulating the product demand. In addition, decommissioning of existing gas transportation routes along with growing investments to replace it with effective conduits will augment the industry landscape. Escalating demand for hydrocarbons on account of rising population will foster the global market. Rapid urbanization and expansion of industries primarily across the emerging nations will positively impact the business outlook. Ongoing government investment to improve the gas accessibility along with growing need to upgrade the existing network to suffice the escalating demand will enhance the industry growth. In 2016, The Infrastructure and Projects Authority in UK has planned an investment of around USD 7.6 billion for 13 gas distribution and transmission projects. Rising discoveries of shale gas reserves along with immense potential of numerous untapped reservoirs across the globe will stimulate the gas pipeline infrastructure market. Recovery of oil & gas prices coupled with growing focus toward E&P activities primarily across countries with abundant shale reserves will enhance the industry outlook. In 2016, the China Geological Survey announced the discovery of shale reserve of 13.54 trillion cubic meters across the Guizhou province. 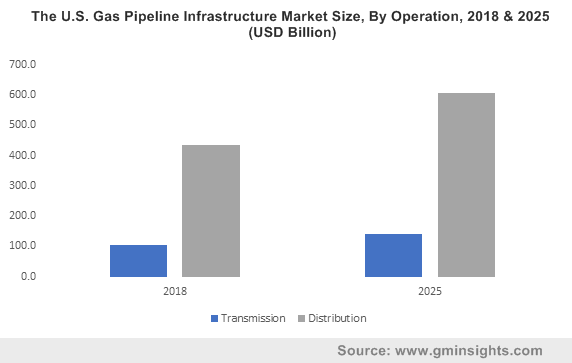 Rapid globalization along with need to bolster the international and interstate trade will fuel the transmission gas pipeline infrastructure market. Majority of the countries across the globe are primarily dependent on the import and export of hydrocarbons in order to meet their energy demands. In 2016, Fluxys Belgium and GRTgaz created an integrated gas grid by introducing a new transmission network across Pitgam. The facilities will involve the transmission of 8 bcm of additional capacity per year between the Belgian and French stations. Indispensable requirement for establishing the distribution network in order to meet the growing energy demand will drive the gas pipeline infrastructure market. The 13th Five-Year Plan across China is obliged to allocate funds for the expansion and development of dedicated pipeline systems. Constant support from the regional governments toward the expansion of existing network will further augment the business growth. The onshore gas pipeline infrastructure market is set to grow over 4% by 2025. Ongoing refurbishment of existing pipeline network along with growing emphasis toward enlarging the land conduits will propel the business growth. In 2017, Jemena, the Australian energy infrastructure company was appointed by the Northern Territory Government to operate and construct a pipeline project estimating over USD 634 million and stretching up to 622 km. The projected was expected to start the operation by 2018. The offshore gas pipeline infrastructure market was valued over 100 billion in 2018. Increasing number of oil and & gas development projects coupled with rising investment toward subsea E&P will positively enhance the industry outlook. Extensive requirement for offshore pipeline infrastructure to facilitate international imports and exports will augment the industry landscape. In 2017, Gazprom initiated the construction of TurkStream offshore gas pipeline which connected Russia and Turkey. Periodic need for gas compression across long distance transmission along with varied geographical and weather patterns will encourage the integration of gas compressor stations. Introduction of stringent safety parameters concerning gas transportation coupled with advancement of technology with introduction of advanced compressor stations will augment the business landscape. 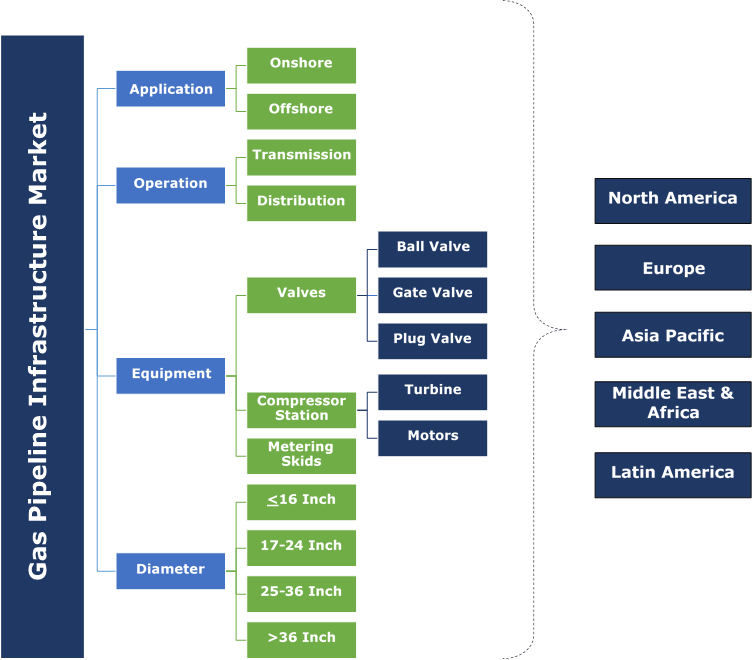 Ongoing penetration of IoT integrated devices coupled with introduction of remotely operated automatic valves will foster the gas pipeline infrastructure market. Stringent industry standards pertaining to the product quality coupled with need for advanced control systems to ensure safe operations will positively enhance the industry outlook. Increasing demand for clean energy resources coupled with growing interstate trade for supplying natural gas across high demand regions will drive the 24-36-inch gas pipelines. Respective governments have allocated funds for upgradation and expansion of existing pipeline infrastructure. In 2017, the National Development & Reform Commission and National Energy Administration collectively announced the expansion plan that ensures access to natural gas to cities exceeding population of over 500,000 residents. Ongoing initiatives to replace the ageing infrastructure coupled with rapidly expanding midstream industry will stimulate deployment of <16-inch gas pipelines. Ongoing city gas distribution projects coupled with government measures to enhance the accessibility of gas infrastructure will complement the industry landscape. The U.S. gas pipeline infrastructure market is set to grow over 4% by 2025. Rapid increase in gas connected users along with ongoing upgradation of unreliable conduit system will boost the product adoption. In 2016, as per the EIA, the cross-border transport capacity across Mexico which stands at 7.3 bcf have witnessed a substantial upsurge and is likely to double within 3 years. It further quoted that the national pipeline exports have increased significantly over the years. Iran accounted for over 35% share of the Middle East & Africa gas pipeline infrastructure market in 2018. Rapid increase in the E&P activities across newly discovered oil & gas fields on account of upliftment of international sanctions will accelerate the industry growth. The government is focused toward leading the global gas exports by outproducing Qatar. They further announced that the production has doubled in the last four years and has planned to initiate 5 phases of South Pars field. 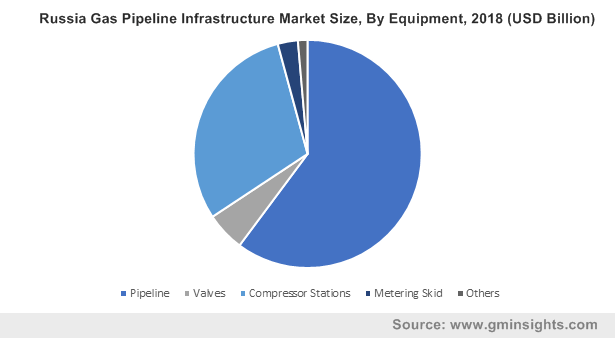 Eminent players across the gas pipeline infrastructure market include Enbridge, Europipe, Gazprom, CRC Evans Pipeline, APA Group, Snam Rete, General Electric, Redexis, Technip, Saipem, MRC Global, DCP Midstream, Chelpipe, Welspun, Engas, National Oilwell Varco, GAIL and Perusahaan Gas Negara. Key players across the industry are adopting various growth strategies including mergers & acquisitions in order to sustain their position. The companies are pursuing long term contracts with other EPC contractors in order to take advantage of the expertise and technical capabilities. In addition, eminent players across the industry are further expanding their footprint across new geographies in order to capture the immense growth prospects. The pipeline infrastructure plays a substantial role in transmission, distribution, storage of hydrocarbons. Small gathering lines are laid from the well to the processing facilities, where the contaminants are removed for further transportation. In order to facilitate a secure gas transportation operation, the gas is compressed at desired pressure at neighbouring compressor stations. Further the pipeline infrastructure includes valves, metering skids and control stations.